Released August 1995.The third and final Avengers trading card set. Colour and black and white photos. Cards are common border with regular varnish finish. Number of cases produced: 300. Promo cards: C1-C3: Colour promos (C3 is UV coated). Chase cards: "Premiere" cards P1-P6; UV coated, full-bleed design. Randomly inserted into foil packs. Collated so that all six cards are available in each display box. "Premiere" cards P7-P9: UV coated, full-bleed design. Available only through mail-in offer ($4.00 per set including postage). Autographed card - Patrick Macnee signed 500 specially printed autograph cards. Redemption cards for the autograph cards were randomly inserted into the foil packs. The redemption card is to be mailed in to Cornerstone and an autographed card is mailed in return (the redemption card is not returned!). 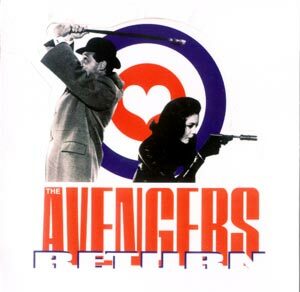 The Avengers Return IT7 was given to subscribers to Cornerstone's Inside Trader magazine.